Home » Current Shows » Spoken Word Shows » Gamers of the Round Table » Top 10 reasons to be excited for Mafia 3. Top 10 reasons to be excited for Mafia 3. With “Mafia 3” finally on the horizon and only a few days away, being one of the most unique games to come out this year I am here to tell you 10 reasons why you should be excited for Mafia 3. New Bordeaux is a re-creation of the famous city, New Orleans, which is not your typical Mafia setting, when you think Mafia you think New York (God Father) and (GoodFellas), New Jersey (Sopranos) and Chicago (Capone) and (the Untouchables). New Bordeaux definitely sounds like an interesting city in the south to get lost in and explore every square inch of. Vito Scaletta makes his return, the main protagonist from Mafia 2 plays a big part in helping Lincoln Clay take down Sal Marcano. After the events of Mafia 2, Vito Scaletta gets forced to go live in New Bordeaux and exiled by the Italian mafia there, he then decides to join forces alongside Lincoln. Mafia 3 easily has one of the most ambitious and most recognizable soundtracks on a video game to date. Staying authentic to the 60’s, Hangar 13 has brought us a blast from the past, bringing songs to the game like FORTUNATE SON by CCR, PAINT IT BLACK by The rolling stones, HOUSE OF THE RISING SUN by The Animals and LITTLE LESS CONVERSATION by Elvis Presley and so much more. From classic rock to southern jazz and blues of New Orleans. 6. DUKES OF HAZZARD driving. Hangar 13 expressed later on last year at GamesCom 2015 that they wanted you to feel like a Hollywood stunt driver, by drifting cars around corners, hitting large jumps and outrunning police in the city and back country roads. Roaring v8 engines in cars of the time like Dodge Chargers and Gran Torino’s, you will truly feel like Bo and Luke Duke or Starsky and Hutch. 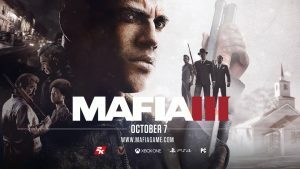 In Mafia 3 you have many ways you can tackle a situation, you can take the stealthy approach, going up behind enemies and doing brutal takedowns with a knife or your fist or, you can go into a situation guns blazing; having a complete weaponry in your arsenal from double barrel shotguns to C4. Which you can blow everything up and leave a trail of fire behind you just enough to watch their empire crumble or you can take the stealthy approach and make some of the guys work for you to bring in a bigger reward. Bringing authenticity to the 60’s was going to be tough and sometimes controversial, with the civil rights movement, discrimination, and the movement against the Vietnam war. Hangar 13 in a couple interviews last year (2015) when the game was first announced expressed how they knew it was going to be hard to tackle a game like this with your character and the time period, but they handled the issues very well. You play as Lincoln Clay (he is not your average mobster). Lincoln Clay is a biracial orphan and Vietnam veteran who grew up around the black mob in New Bordeaux. When Lincoln returns from the war he finds his family being slaughtered including himself being left for dead; Lincoln finds himself on a path of revenge against the Italian mafia (The Marcanos). New Bordeaux is split up of 10 different Districts, because of your character if you are in the wrong part of town and someone notices, the cops will be called. The districts are, Delray hollow where Lincoln grew up, Frisco Fields the high society but, with a gritty underbelly, The French Ward, The bayou,Pointe Verdun, Southdowns, Barclay mills, Tickfaw Harbor, Downtown, and River Row. Through out the game of Mafia 3, while you are on the mission of revenge against the Marcanos, you can take over various crime syndicates to have an income these rackets include the following, drug markets, Safe houses and getting valuable information from their lieutenants, hunting down pimps, gambling dens and cargo that “fell off a boat or truck”. Once these are taken down you can rebuild them for your self to bring in money and you can choose one of your lieutenants to run the operation. Well there you have it, folks that are 10 reasons to be excited for Mafia 3, Remember its nothing personal, its just business. Mafia 3 is due to release on October 7th on PS4, Xbox One and PC. Written by ICE at Gamers of the Round Table.